or limiting subsidies to 20 per cent of actual electricity demand in 2020 instead of an estimated 26% under existing policy (it is now about 17%). The Abbott government’s decision on RETs is as important as the decision to repeal the carbon tax because a continuation of subsidies would imply acceptance of dangerous global warming. Indeed, no matter which of the alternatives is used to continue subsidies that would risk locking Australia into having a continued high proportion of energy from a highly inefficient source –either 17 or 20%. Of course, the postponement of any substantive scheme to reduce subsidies would avoid the almost certain political need to provide now some program of compensation to power producing businesses for their “lost” investment. But it would miss an opportunity unlikely to readily re-appear of establishing a scheme which over time eliminates or reduces subsidies. The need to go further than the RET Review proposes is highlighted by the enormous cost imposed by the use of renewables, either reflected in electricity prices or in the cost to taxpayers of financing the subsidies which reduce the effect on prices. The review itself estimates that if subsidies continue under the existing scheme an additional $22 billion would have to be provided on top of the $9.4 billion already provided. 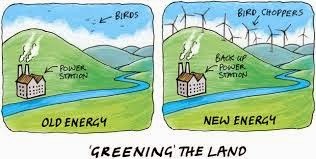 Alternatively, to the extent that the costs are passed on in higher electricity prices, they will reflect the estimate by expert Alan Moran that the cost of electricity from wind mills is 2-3 times more than from fossil fuel plants and the cost from solar is much higher even than wind mills. Relevant to this is the outdated basis of the policy of subsidising of renewable energy. That is based on the belief that continued usage of fossil fuels (coal) will cause temperatures to increase to dangerous levels. But since the subsidies were started under the Howard government, uncertainties about the dangerous warming thesis have increased to the point where there is now no justification for retaining policies which aim to reduce fossil fuels usage. That signal needs to be sent. My letters published today (see below), which suggest that temperatures have almost certainly risen by much less than the BOM has published, provide only one example of the uncertainties. A policy which starts to phase out the provision of subsidies to investments in renewables would indicate that the government is moving away from policies involving the reduction of emissions. Importantly, The Australian continues its lone wolf role in exposing apparent deficiencies. It is reported, for example, that while a review panel in 2011 cleared the BOM as having world best practice, that organisation has not carried out the panel’s decision to clearly explain its adjustment technology. Comparing the bureau’s adjusted temperatures for Melbourne and Laverton (about 18 kilometres away), for example, shows that the minimum temperature for Melbourne increases over time at a much faster rate than it does for Laverton (0.22+/-0.04 degrees C per decade faster). This means the warming effect from Melbourne buildings close to recording thermometers is overlooked by BOM. Excessive reductions by BOM to Darwin’s temperatures before 1941 (when the recording shifted to the airport) have also created an unwarranted upward bias. Unsurprisingly, international temperature databases do not use the BOM adjusted figures for Darwin. Arguably, the BOM should also at least draw attention to the reason for the 0.4C jump in adjusted temperatures between the average for 1910-1978 and subsequent periods. This jump is clearly due to natural rather than human influences. There is a strong case for an independent inquiry into the adjustment methodology used by BOM. In responding to David Karoly’s rejection of [scientist] Jennifer Marohasy’s research suggesting the adjusted [(homogenised)] temperature records published by the Bureau of Meteorology have an upward bias, Michael Asten draws attention to adjusted temperatures for two weather stations which seem to confirm that (Letters, 28/8). But comparing BOM adjusted temperatures for Melbourne and Laverton (about 18 kilometres away) suggests the same bias. Such a comparison shows that the minimum temperature for Melbourne increases over time at a much faster rate than it does for Laverton [(0.22+/-0.04 degrees C per decade faster)]. This means the warming effect from Melbourne buildings close to recording thermometers is overlooked. It is surprising that [neither Environment Minister Hunt nor] the BOM have explained the adjustment procedures and why they suggest an upward bias. There is a strong case for an independent inquiry into BOM’s methodology.